Jason and his Argonauts went searching for the Golden Fleece and he found it at Colchis and then he had to defeat the Hydra and all of those skeletons that came from her teeth to get it. 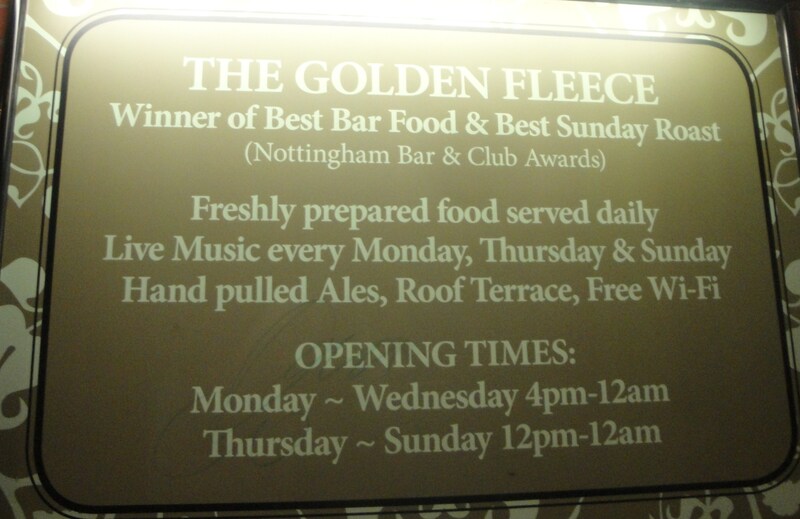 I went hunting for some food on Mansfield Road and when I found the Golden Fleece, I just had to defeat a Cajun Chicken Breast Burger. Now I suspect it is highly unlikely that my meal will become the stuff of myths or fables, but nonetheless it is worth writing it down here for future consumption and persusal. I had to defeat the sandwich on my own and was not able to call upon Hera to help me, I could have called upon my friend Martin, but he had his own battle and quest on this occasion as he was taking on one of their lamb burgers. 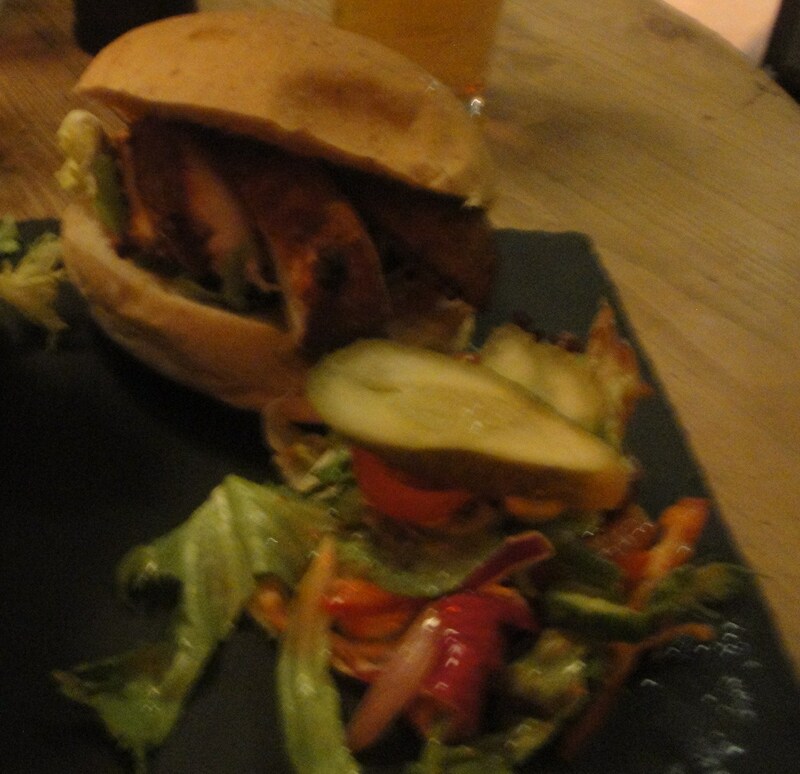 I was challenged with a slate plate covered with my Cajun Chicken Sandwich, (lets call it what it is, it wasn’t a burger), it was a huge thickly sliced chicken breast in a soft white burger bun bap. There was so much chicken stuffed in there that at least two 1 inch thick slices fell out as I was trying to get my mouth around the bun. There was a quite good cajun style spicing coating the breast. A bit of cheese and some spicy mayo added some juice to the sandwich. It came with a good leafy salad that was a little overdressed in that it was a little bit too oiled. 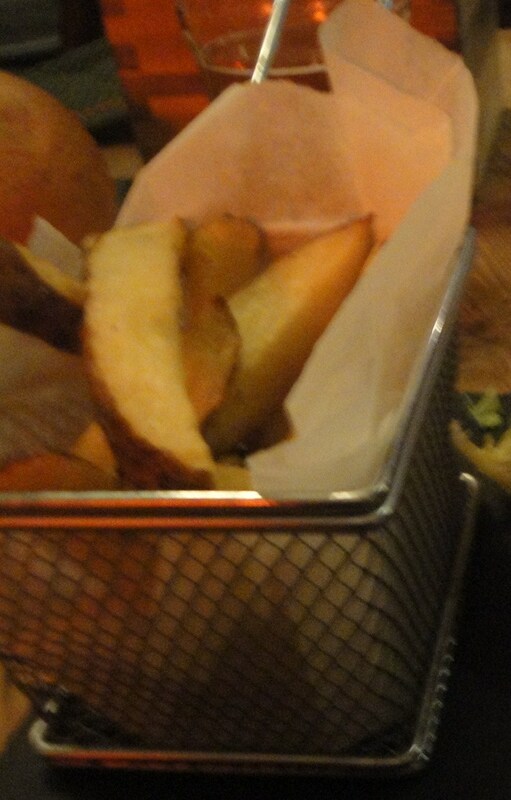 There was also a small individual fryer basket of home cooked chips that were really well done. The skin was still on and it seemed that basically they had just chopped a big potato up into larger thick chunky slices and then deep fried them. The only thing was that the chips were soft inside and not really that ‘fried’ so I did wonder if they had been oven baked and placed into the basket for effect. Or Perhaps they were just cooked so well that they were not at all greasy and I was being double bluffed in the world of chip preparation. Their “Famous Golden Fleece Burgers'” are billed as “Freshly prepared and served in a wholemeal bun. All burgers come with mayo, salad and chunky chips. The beef burgers are homemade using rump steak and the veggie burgers are a special three bean and parsley recipe”. Maybe on a future visit I will just go for one of those. If you want to add a topping they have an interesting selection including ‘Avocado and Stilton’, ‘Halloumi and Red Onion Compote’, ‘Fiery Chorizo’ and ‘Sour Cream and Guacamole’ or if you have no adventure left in you after your own quest or hunt for food, you can just go for the “Cheese and Bacon’ topping.